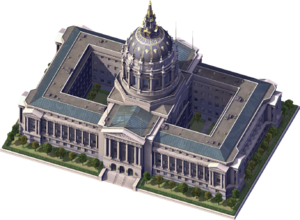 San Francisco City Hall is a downloadable Landmark Building for SimCity 4 Rush Hour/Deluxe, released as the Plugin Pack 017 free Downloadable Content. It is a recreation of San Francisco City Hall in San Francisco, California, United States of America built in 1915 as it appeared in 2003. The News Ticker fluff entry created on its placement is "San Francisco City Hall Puts #city# City Hall to Shame".